“The Games People Play,” Work by Rosita Fogelman, Paul Gaviglio, Leslie Grunditz, Mary McDonald, Mani Narayan, Nicholas Powell, Case Conover, and Christine Rossi. At K Gallery, Rhythmix Cultural Works, Alameda. Literal games feature prominently in the exhibit, most notably in the work of Chris Rossi. 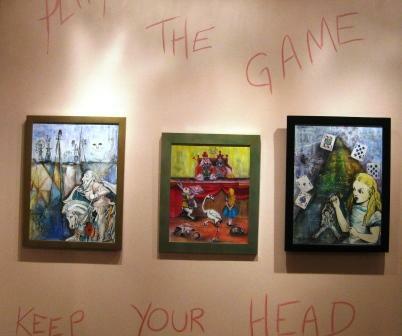 Rossi’s Alice in Wonderland collages, including “Play the Game, Keep Your Head,” are among the highlights of the exhibit and help tie other work together visually and thematically. Nicholas Powell contributes two fantastic retro series for the show. The first is a set of four pen-and-ink images of card tricks. I mean no disrespect to say that these are highly marketable. They would compliment the most lavishly decorated billiards room. 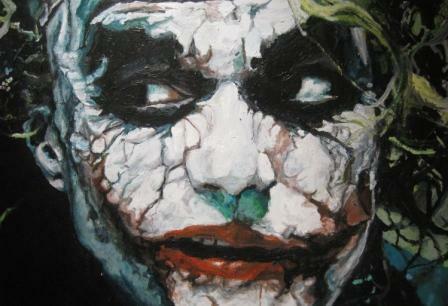 The other is two mixed media pop art pieces and, except for the detailed work with a pen, they are scarcely recognizable as having been created by the same artist. There are other artists who make single but notable contributions to this exhibit. In his statement Case Conover describes his work as “playful and experimental,” but although his “One Thousand Spins of the Doodle Top” starts with a toy it becomes ritualistic, bordering on compulsive. It draws the viewer in like a mandala. As for the other, I’ve seen a lot of doll-based pieces lately, but Leslie Grunditz’ “Oh How Sweet” is a cut above. It suggests both the sickly and trapping qualities of sticky sweetness, as well as a visceral re-interpretation of Barbara Kruger’s “Your Gaze Hits the Side of My Face” or the horrors of plastic surgery gone wrong, à la the protagonist’s mother in “Brazil,” melting away in her casket. The statement for the show reads, “Artists play with the concept of mind games, pastimes, ritual and social interaction… from the literal to the subjective….” It isn’t always clear how each piece meets this criteria, but I’m not complaining. These games thoroughly entertain. “The Games People Play” shows at K Gallery through May 8th. This entry was posted on Sunday, April 11th, 2010 at 8:44 pm	and is filed under Artists, Raves. You can follow any responses to this entry through the RSS 2.0 feed. You can leave a response, or trackback from your own site. This sure wouldn’t have been my favorite show. I know that these artists are creating something that speaks to them, but to anyone else????? Are they trying to put something over on the general public? I think I was okay with it till it came to the Barbie. Awful. Am I speaking my mind, or what? As usual though, your writing is superb.